A wide range of issues were deliberated during meetings held in Nha Trang, the central coastal province of Khanh Hoa, on February 28 within the framework of the first APEC Senior Officials Meeting (SOM1) and related meetings. 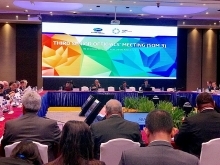 At its meeting, the Committee on Trade and Investment (CTI) re-examined the work plans in 2017 of subordinate working groups such as Chemical Dialogue (CD), Life Sciences Innovation Forum (LSIF), Intellectual Property Rights Experts Group (IPEG) and Sub-Committee on Standards and Conformance (SCSC). Delegates from the 21 Asia-Pacific Economic Cooperation (APEC) Forum also shared new initiatives that can be implemented in the coming time, focusing on fostering the participation of small- and medium-sized enterprises (SMEs) in the global value chain, dialogues on regulations of origin, and enhancing the capacity of negotiating free trade agreements. As a committee coordinating the APEC trade and investment liberalization agenda, the CTI put forth initiatives and solutions that are crucial to promoting economic connectivity amid slow global economic and trade growth. Delegates attending the EC meeting re-examined the APEC Structural Reform Agenda and the APEC Ease of Doing Business Action Plan for 2016-2018, and at the same time, proposed a number of new initiatives. At the meeting, Dr Vo Tri Thanh, a representative of the Vietnamese delegation, briefed the participants on Vietnam’s recent economic situation and development prospects in the future. Thanh noted that it is now a turning-point in Vietnam’s reform process, adding that domestic reform and international integration is connected more closely. Vietnam needs to change its development model and create a firm foundation to overcome the middle income trap facing regional economies, he suggested. During the SOM Steering Committee on ECOTECH (SCE) Meeting, the chair of its subordinate working groups presented an action plan for 2017 that was approved in meetings in recent days, and highlighted activities that contribute to the implementation of four priorities in APEC Year 2017. The SCE also deliberated the performance of capacity enhancement policy with the aim of providing more resources, experience and expertise for developing economies to deploy their commitments and take full advantage of APEC cooperation opportunities. 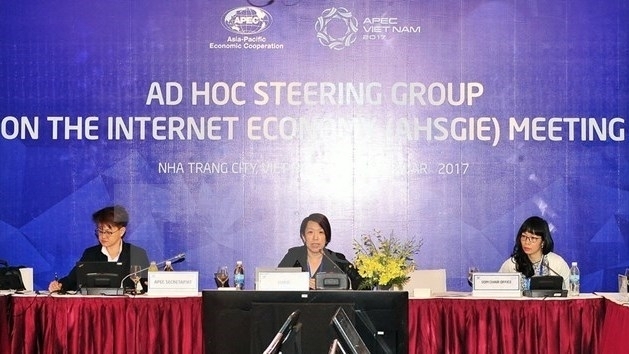 The Ad Hoc Steering Group on the Internet Economy (AHSGIE) wrapped up its activities today after endorsing steps to build an Internet Economy Roadmap scheduled for completion by the end of 2017. This was the final event of working groups within SOM1 and related meetings.